How many streets, towns, parks and rivers in the world have your name? With this fun app you can quickly view your far-flung assortment of asphalt namesakes. 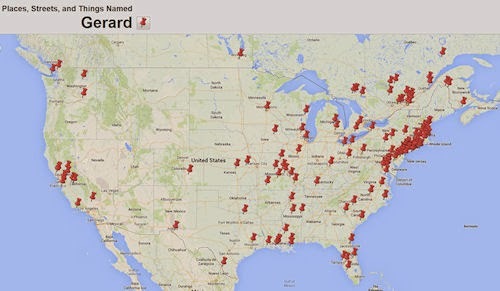 Type your first name, click 'Map It' and find out. Holy cow...I'm ALL OVER the eastern seaboard! The map is not complete - every time i go to Santa Rosa from Calistoga I see a "Michele Way" off Calistoga Road. It's a very short road, so that's why it was missed. Funny, I live on a street that's the same as a common first name, but it doesn't show up on the map. It's marked in other parts of the country, but my street is not marked.